The MyM simulation language uses a compact notation for specifying continuous models, keeping loops implicit whenever possible and providing several predefined integration methods for time- dependent functions (Runge-Kutta 1, 2, 4 and 5). Different time domains can be used in the same model. Results can be stored at different sample rates. A model consists of a sequence of declarations (of a constant, a variable or a module) and equations. The order is free, except that a constant or variable has to be declared before being used in equations. The MyM simulation language contains a large number of predefined functions. Users can add their own functions by linking external C or Fortran functions or by declaring domain- dependent variables. Input variables of the latter kind are set by specifying function values for a number of domain values, with MyM taking care of the interpolation for other values; dependent functions are defined by an integration formula or algebraic expression. 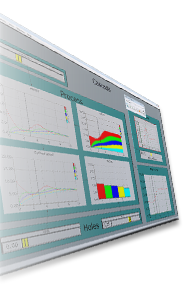 The Graphical Interface Manager (MGIM) is a separate application used to design and run graphical interfaces for MyM models. When a model has been compiled successfully, it can be loaded into the MGIM and the developer can start designing an interface by dragging graphs to the interface. An interface consists of one or more views and thus different perspectives on the same model. A view is a tree, a hierarchical clustering of model variables into named subsets. Views are depicted as boxes within boxes. Users browse through these views by opening and closing boxes and by zooming in and out. Each leaf contains at most one variable. This variable is presented by an appropriate graph, which in the case of input variables can be directly manipulated by the user. Equations are used to derive a dependency graph which is shown by arrows. The current version of MyM runs under Windows Xp, Windows Vista and Windows 7. MyM requires a minimal video resolution of 1024 * 768 and at least 16 bits colors. A c compiler is required to build models (Visual C++ 8 or Express under Windows). A help system is provided in the system, but as all on-line documentation uses HTML they can also be accessed through common HTML browsers such as FireFox or Internet Explorer, allowing modelers to publish their model documentation directly on the Web if desired.